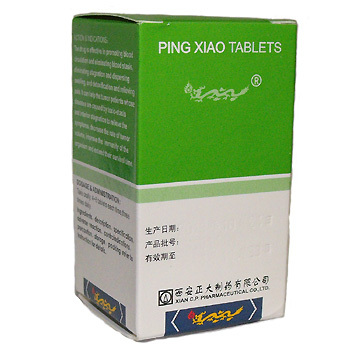 Ping Xiao tablets - alternative cancer treatment! The preparation has the function to promote blood circulation by removing blood stasis, alleviating pain and dispersing accumulation of pathogen, clearing away heat and toxic materials, strengthening the body resistance to eliminate pathogenic factors. It has definite action for remitting symptoms of cancer of the lung, the stomach, the esophagus and the breast, especially efficient to mammary gland hyperplasia, shrinking tumor, restraining growth symptoms of cancer, improving the immunological ability of the body, prolonging patient''s life. Non-toxic, can be used long term without significant side effects. Store in well-closed container, in a cool dry place. XIAN C. P. PHAMACEUTICAL CO., LTD.